Are you looking to throw a girls birthday party near me Houston TX? Why try and find a place that’s far our outside of your budget when you can party at home? To make things even better, why throw a party yourself when you can just have the Rockstar spa bus come to your house and throw it for you? We can make every little girl’s party a dream come true. It will be ready for her to have the most spectacular day. When we’re through, the spa will leave her feeling amazing for days to come. Just explore our options and you’ll figure out just how wonderful our offers are. Remember Your Party As A Kid? It may not be the same for everyone, but for others, their parties weren’t always the best of the best. This wasn’t because of the lack of love or interest, many times the parties were great fun and thrown with a lot of thought. It was just not so easy to organize a great party for a bunch of girls in a way that wasn’t too different from a normal Saturday afternoon with her friends. Girls have a way of turning everything into a gossipy, fun debacle. If you feel like you weren’t able to give your daughter a good party or that you want hers to be better than the ones you had, rest assured. We’ve got options that are so modern and can create an experience for your daughter unlike any other. With a fully renovated spa bus meant solely for her entertainment, you can have a party that would’ve never been possible in years before now. When she is stepping on to our rockstar red carpet into the bus that she’s been waiting for all week, you won’t have a doubt in your mind. She got the most exciting party she could’ve asked for. While we have several packages that vary in the services provided, we want to share with you the many spa treatments that are in our repertoire. To begin with, we will give your daughter and all over her friend’s manicures and pedicures. They will get face scrubs and massages of the feet and the hands. We offer iced cucumber facials and nail designs with glitter tattoos and make up for all. Depending on the package they will be miniature or deluxe manicures, and we will give out spa robes for the special birthday girl. If its one of our packages that includes a mother and daughter, then we can extend these offerings to the mother — she will get her own special treatment, too! Our goal is to bring your daughter the most luxurious and pampering experience possible. It’s so important to build her self-confidence and esteem, this begins on the inside first! If she feels that she is being taken care of and in her best shape, it can do wonders for her. She will be surrounded by all of the entertainment she could ask for. Professional designers will be ready to give her a top of the line spa treatment. Best of all, her friends can join in on the fun. This all goes into the effort we take to give her a great mental picture of joy and luxury. We are dedicated to providing her with such an experience and will not hold back. Our amenities are sure to inspire and invigorate your daughter to help her appreciate her birthday. She will learn that her own well being is the most important thing! 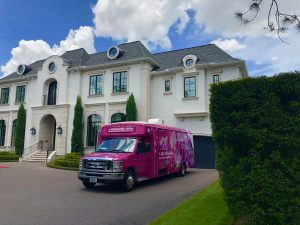 We are happy to come to you, our spa bus will drive anywhere within a 30-mile radius from our location in Cinco Ranch. If you fall within our reach we will come to you free of charge. When we set up our bus, it will be right outside of your home and ready for ease of convenience. We only ask that all of the kids have their feet and hands clean, with their nail polish removed. That way we spend no time beginning on her spa day. If you do happen to add an extra person or find yourself outside of our radius, we will add a few minor fees to compensate for our efforts. Nothing more though, we’re always happy to make the drive! Contact Us To Bring Our Spa Bus To You! If you’re looking forward to setting up a birthday party for your girl, or you need new party ideas for girls, let us be your solution! 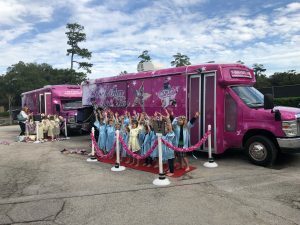 We have all sorts of party packages ranging from princess parties to mother-daughter parties throughout the Houston area. RockStar spa buses have incredible offerings that will surely excited and surprise her. Our top of the line spa treatments and fun amenities will entertain her to no end. It’s our priority to give her the best experience and make sure she is feeling royal from start to finish. You can set up a time for our bus to come by and give your girl a great party now! All you have to do is simply give us a call at 1-844-GIRL-SPA (4475-772) or visit our website now. We’re looking forward to hearing from you soon. Give us a chance to make your daughter’s party experience easier, convenient and more enjoyable than ever before! The earliest settlement of the community known as Cane Island, for Cane Island Creek that runs through it, was in 1872. The townsite of Katy was laid out and platted by J.O. Thomas, L.C. Luckel and R.M. Cash in 1895, supposedly named for the M-K-T Railroad that runs through it. The City of Katy was formally incorporated in 1945. Katy has always been a traditional, family-style community, and it continues to offer residents the charm of a small town. The main industry of Katy TX has actually been rice farming, but they also grow peanuts and cotton too which they have excelled in. For more info about Katy TX, click here!